As you can see, there's a slight problem with it - it's the two door sport model. 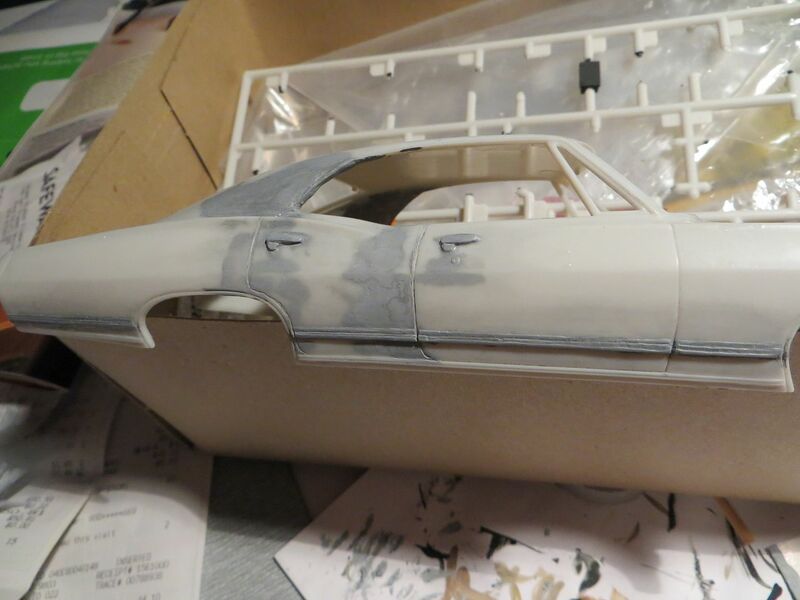 They don't make the four door non-sport model kit. My sister bought it anyway, confident that I would figure out how to get what I wanted out of it. 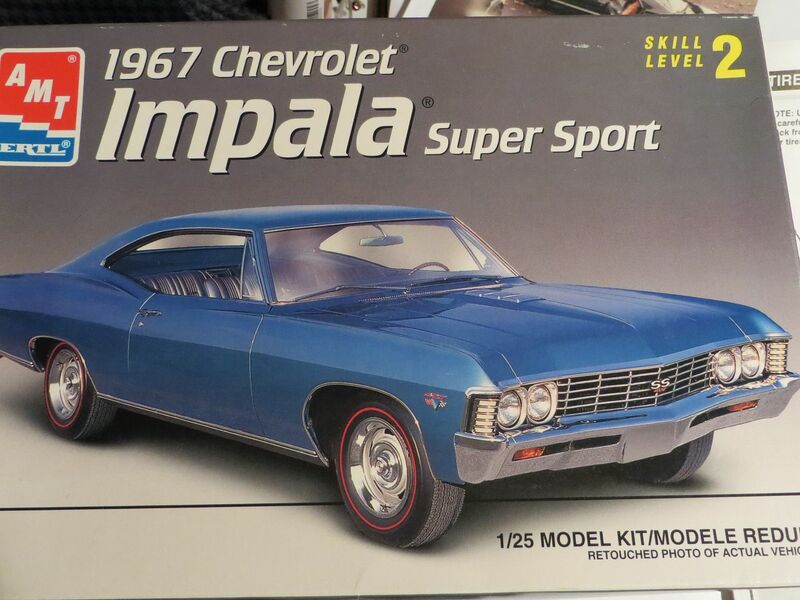 Step 1 - All the reference material that I can get my hands on - I basically just did a google image search and tried to find every single angle of the Impala that I could. 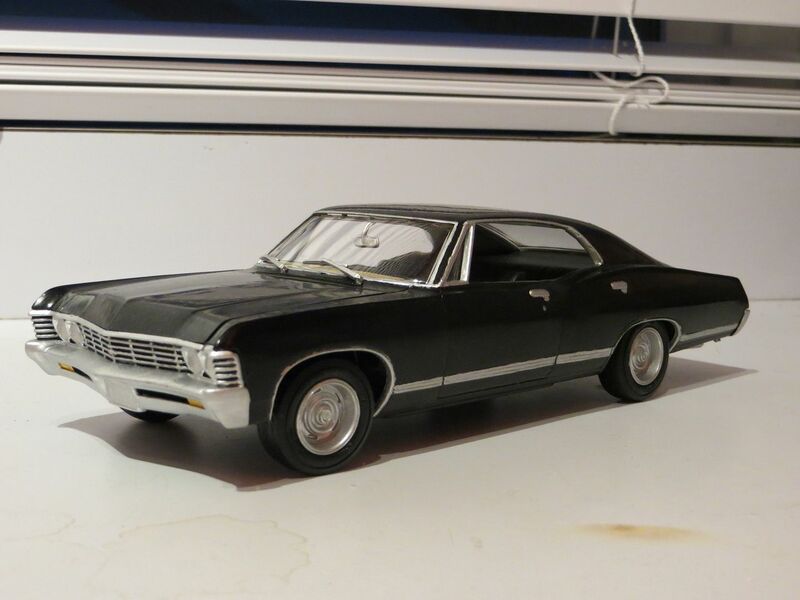 I printed off the best ones and then labeled them as to whether they were picures of the show-Impala (Baby), or pictures of fan Impalas, or pictures of other people's model Impalas. 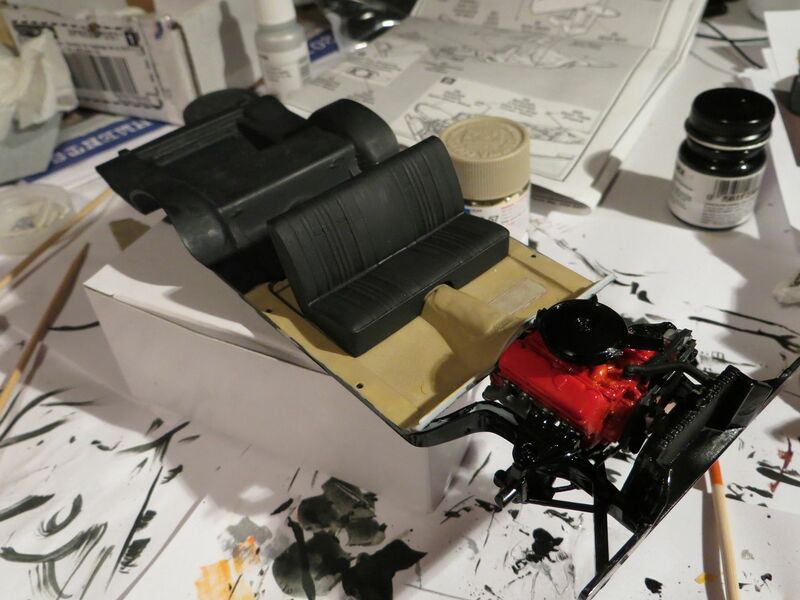 FYI - Painting is my favourite thing, so I was thrilled to paint all the little details on the dashboard. By now, you might be noticing my paint job. 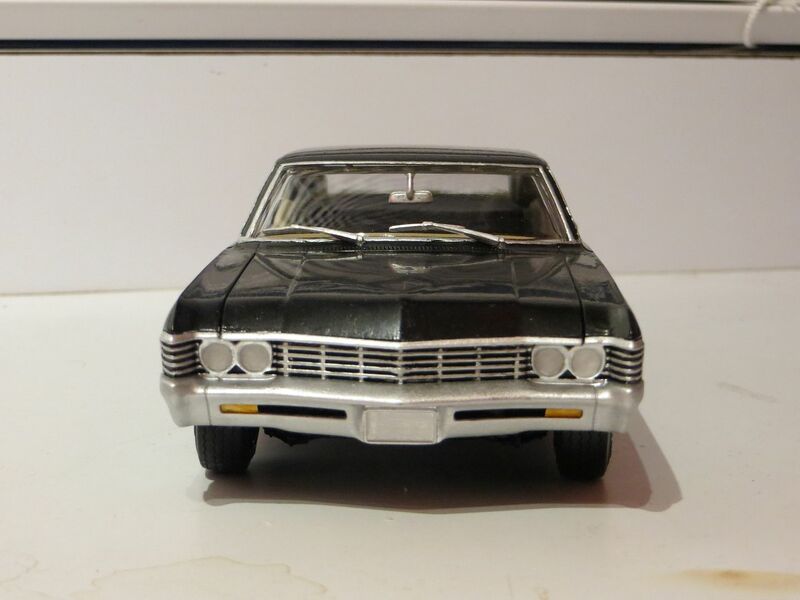 Baby is a very oddly coloured Impala, because she is all black exterior, and the seats have black upholstery, but the rest of the interior is beige. Carpets, interior door, dash... all beige. Above you can see how the door looked before I messed with it (with only a pencil line showing what I'm going to change) and then below is the other door that I've already altered. Now, technically, the back door should have also had a similar design to the front door, instead of that shelf thing that goes straight down to the ground, but there's only so much I can alter, and you weren't really going to be able to see the back very well anyway. 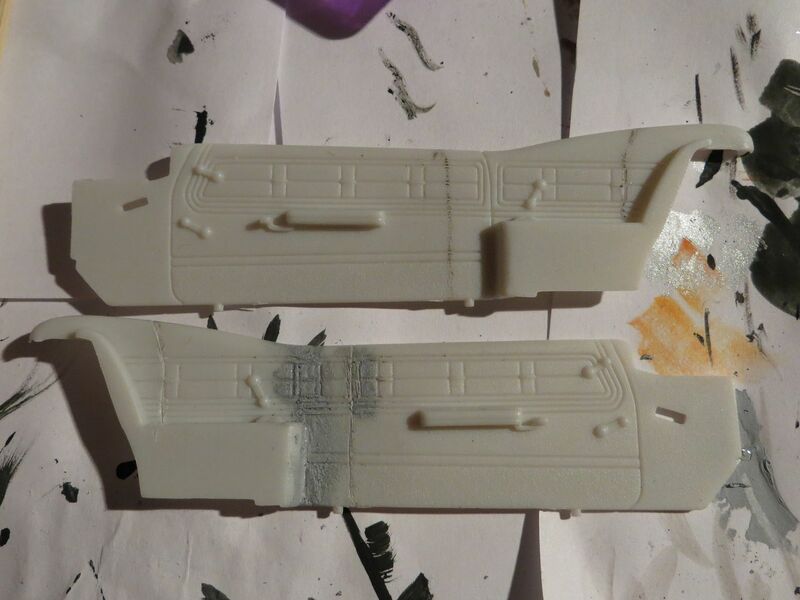 As you can see, I used a bit of clay and I added door releases to the back doors, similar to the ones that the front doors had. This way, it looks like people in the back have a way out and helps sell the illusion that it's a functioning door a little more. 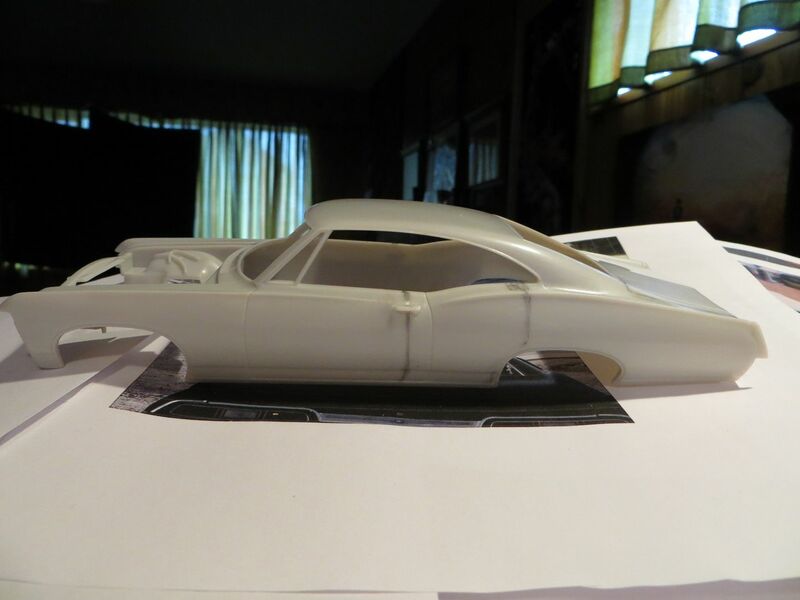 Step 8 - The Body - this was the modification that took the longest, because there were several things that needed to be changed about the details and shape of the body. 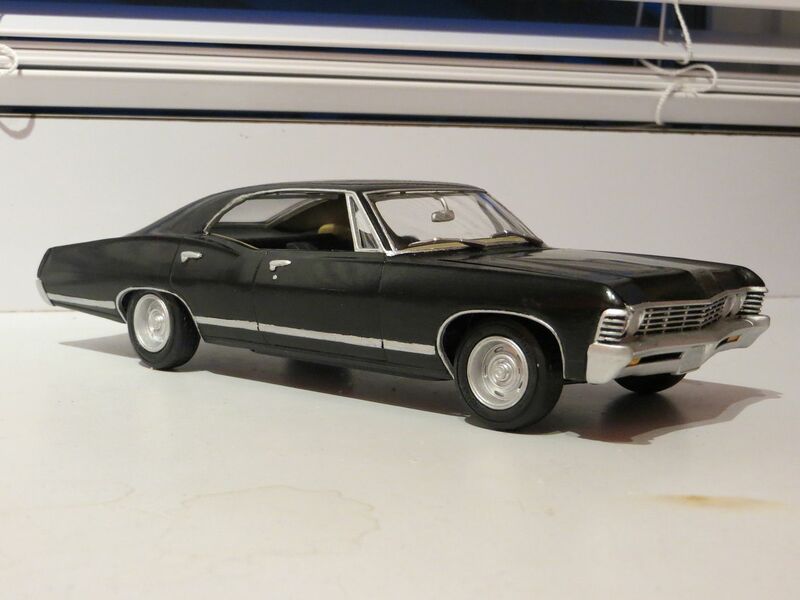 The trunk is wider on the 4-door Impala than it is on the sport model. And that's pretty important when it comes to making Baby... you need to have a large looking trunk for all the weapons (and possibly the body) that you know are in there. 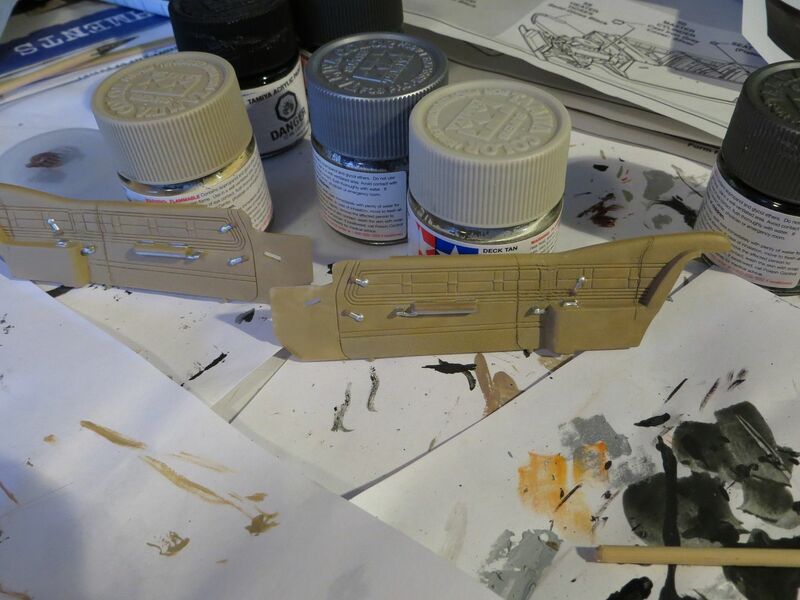 Again, this was just an Xacto knife and putty. 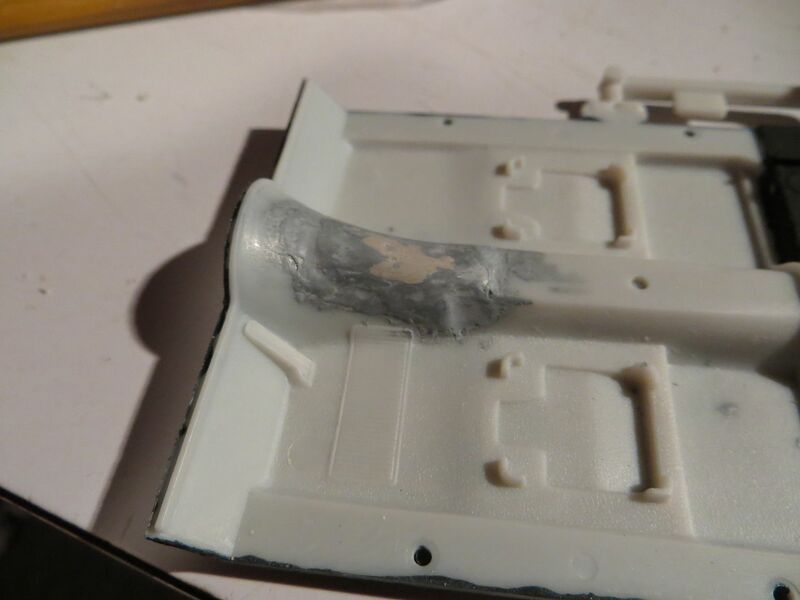 I needed to make back doors, which meant making the front doors just a little smaller... but in doing that, it meant that the door handle would have to be "moved" (sanded off entirely and a new one put on later). 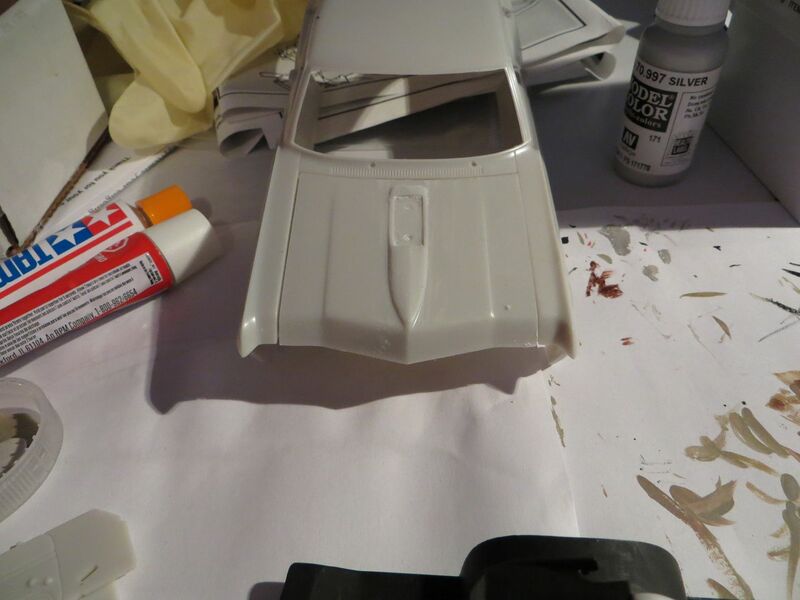 Xacto knive and putty to the rescue! Now, this is the one thing that I couldn't modify to perfection. 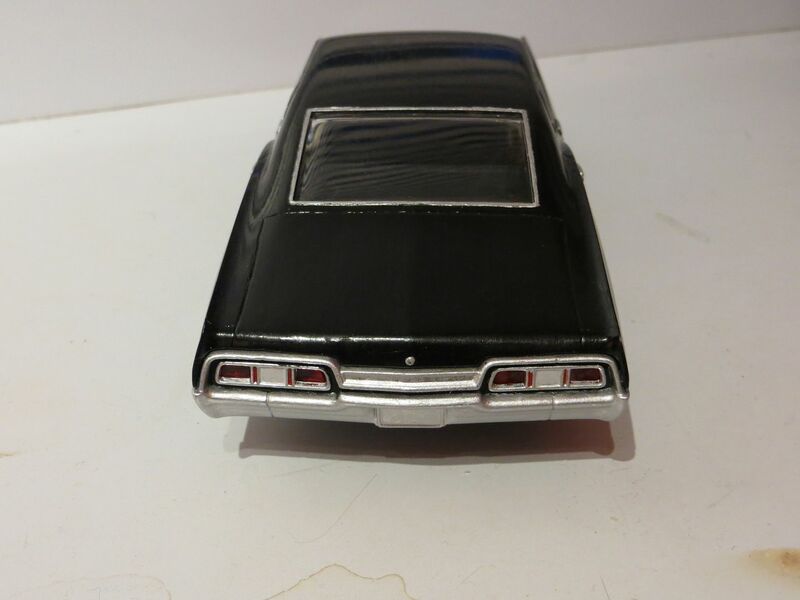 The roof of the 4-door is a different shape than the roof of the sports model. 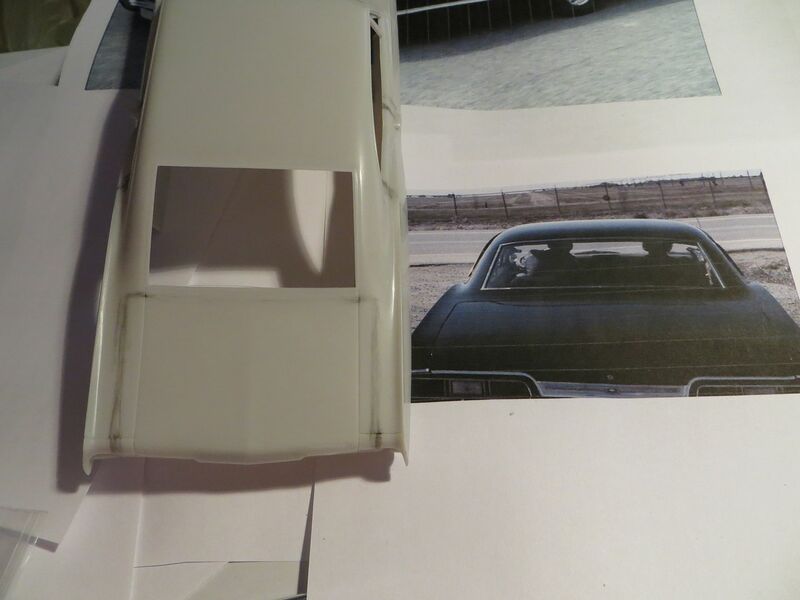 The back window is smaller and at a steeper angle. 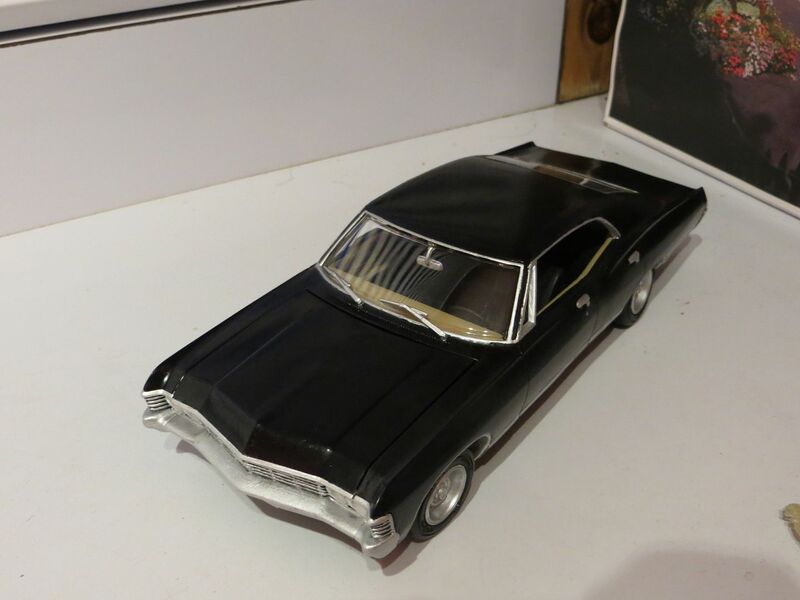 There was nothing I could do about the roof of this model and there was definitely no way for me to change the window, especially if I wanted to eventually put glass in it. You can see in the background the reference picture I was using. 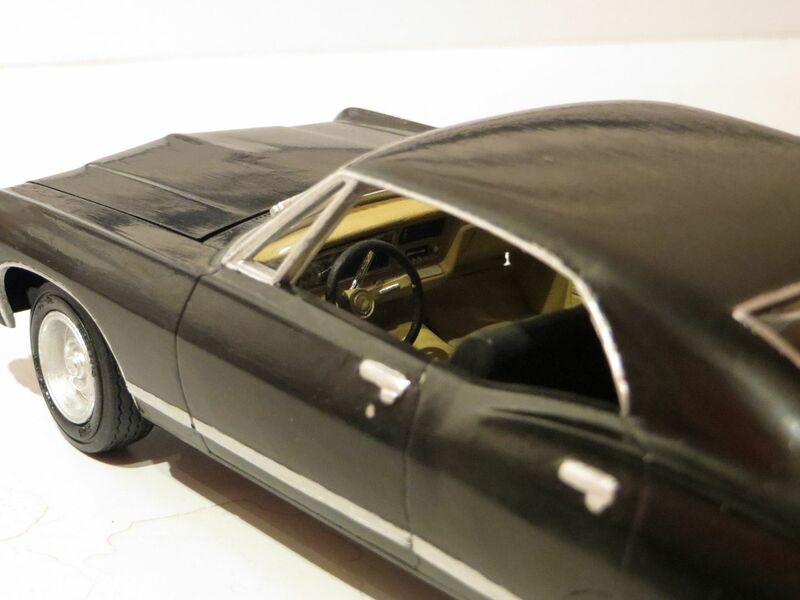 The picture is off the original sport-model body, and then a custom-made 4-door body (because some people have that kind of skill and equipment). Mine is a hybrid of the two. 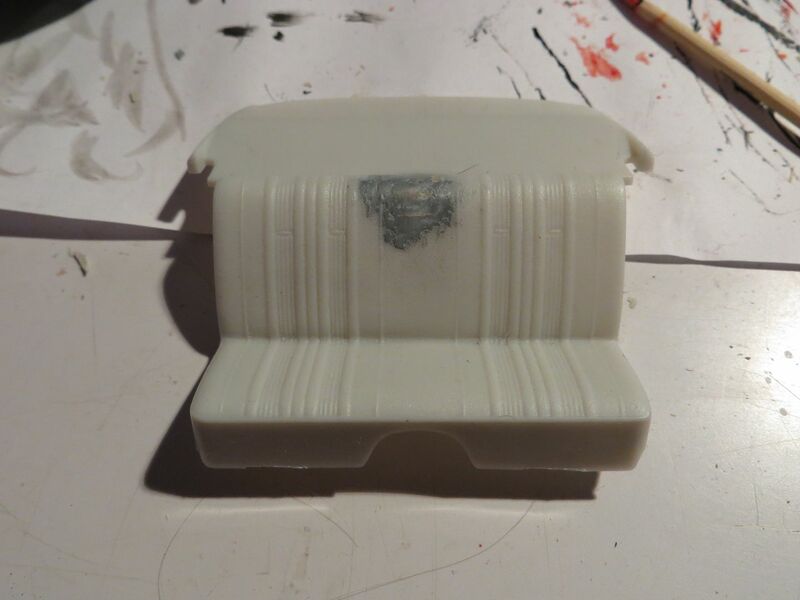 These were done with putty. 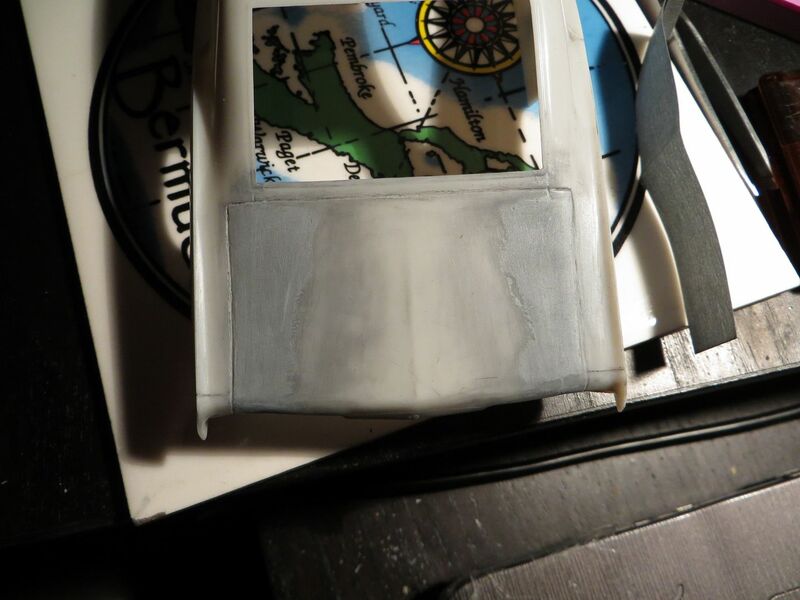 I basically taped where I didn't want putty to go, and then I put a thick layer of putty down. 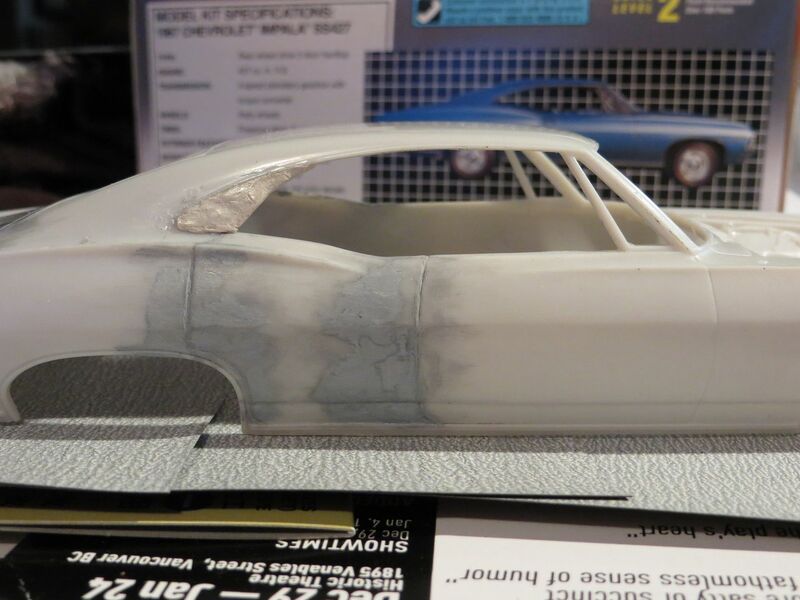 Waited a little, not a lot (putty still had to be a little wet), and then slowly pulled up the tape. The stripe was the most labour intensive part. 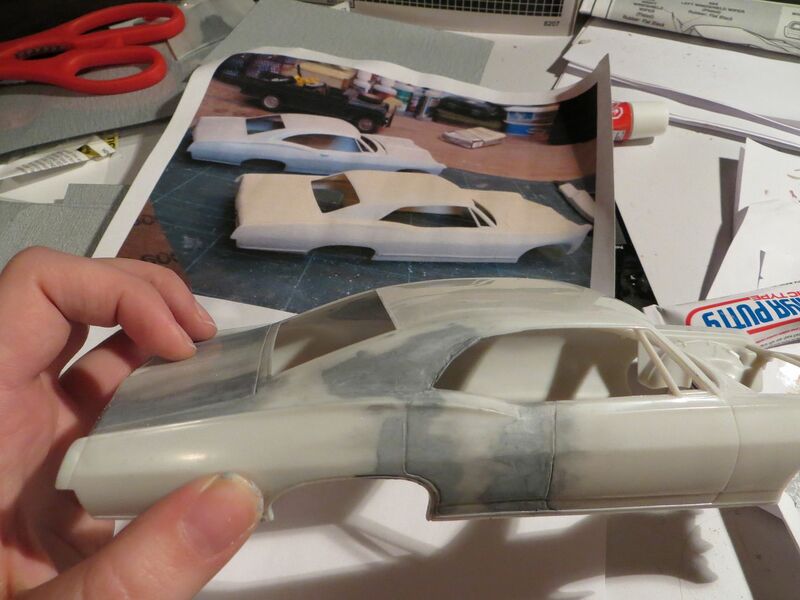 It's actually done in three layers to match exactly how it looks on the car. Unfortunately, when I painted it, a lot of the detail got lost. Live and learn! The picture on the kit makes it look like the stripe is already on the model, but I assure you, it was not - I had to put that thing on. I should say, the other thing I had to do that I did not take pictures of was remove the SS from the front and rear grill. It only took me 60 hours spread over 1.25 years to make! WOW! That's amazing work!! Congratulations! That's just fabulous and you have insane amounts of patience! 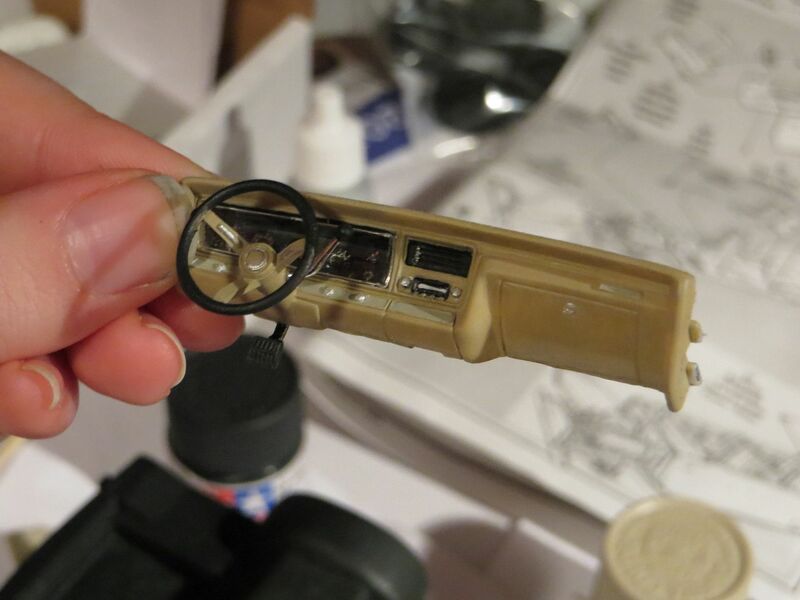 I used to do those kits as a kid (albeit much less complicated ones than that) and I was TERRIBLE at them. That's the hilarious thing, when I did the kits as a kid I did NOT have an insane amount of patience and I was also TERRIBLE at them. It's amazing that all it takes it becoming an adult in order to step back from something for a moment and think "no, that's all I'm going to do today... I'll wait for those pieces to set before I attempt anything else." And suddenly that makes all the difference. Wow! That is super, super cool! Anyway, thanks! I'm pretty proud of myself. Now that I'm looking at mine, I think my kit might be similar to yours. The picture on my box was bright green, however. I'm not sure if the clay would be the go-to for people who do these kits religiously, they'd probably use some sort of moldable plastic or something fancy. I was just magyvering out of materials that I knew how to work with. WOW! I am very impressed. 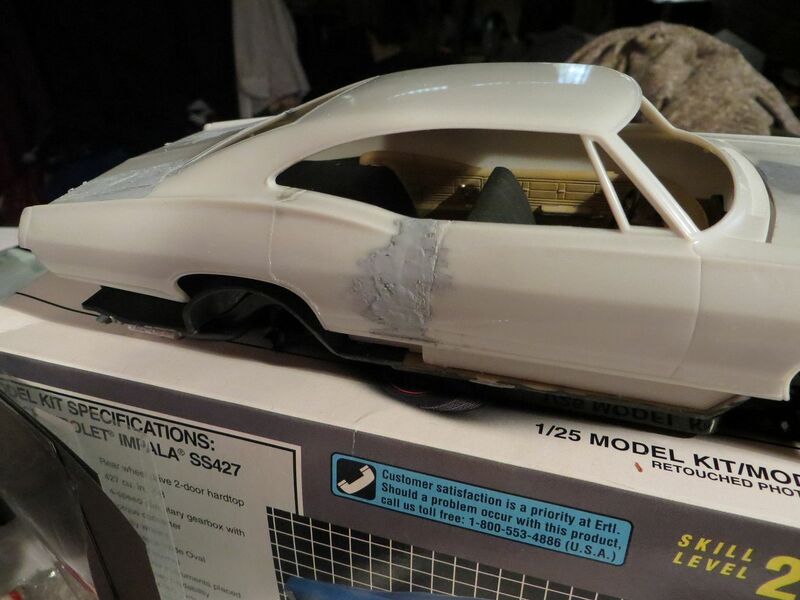 To take a model for a 2-door and turn it into a 4-door, those are some mad skills. I could never do that. Love the car. What a lovely treasure. Now, the only thing missing is the license plate. Are you going to add that? If so, which one, the KAZ or the CNQ? GREAT job! What an amazing job you did there! 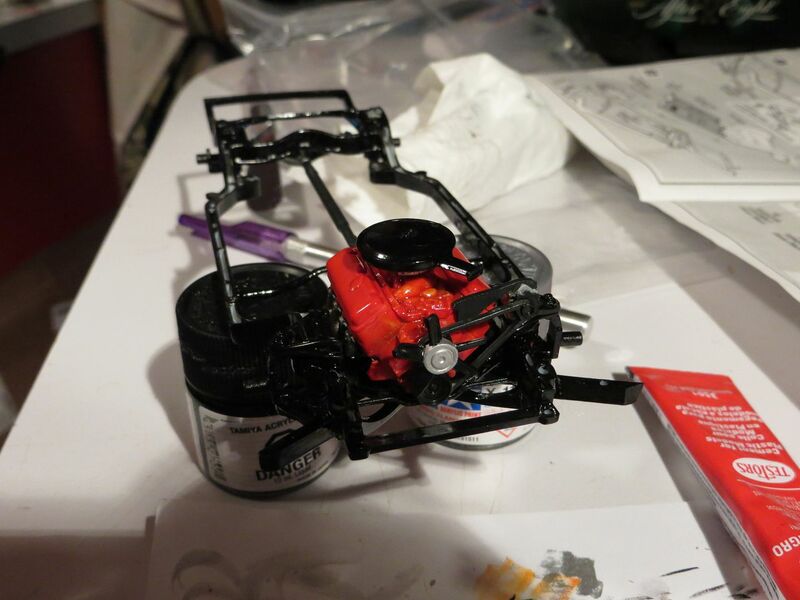 Enjoyed your sharing the details of what you had to do to modify the kit - what a great job at modifying too! 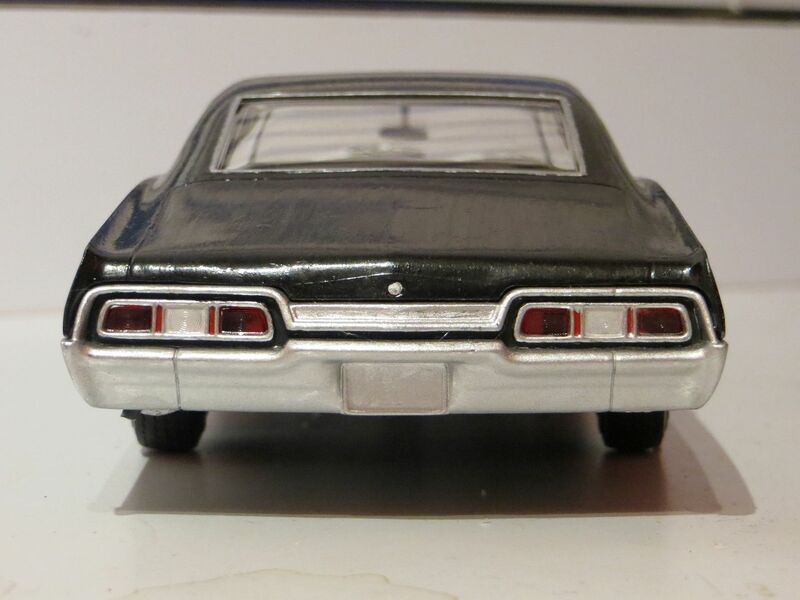 I noticed comments about the license plate - what about using a Shrinky Dink? 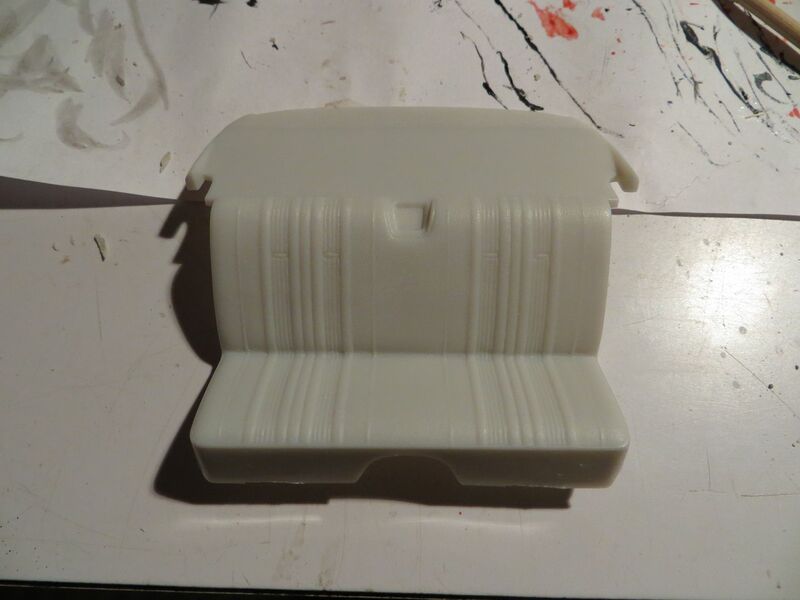 They have the ink jet ones that can have anything printed on them and then you bake them in the oven - it shrinks a lot! What would the size need to be? 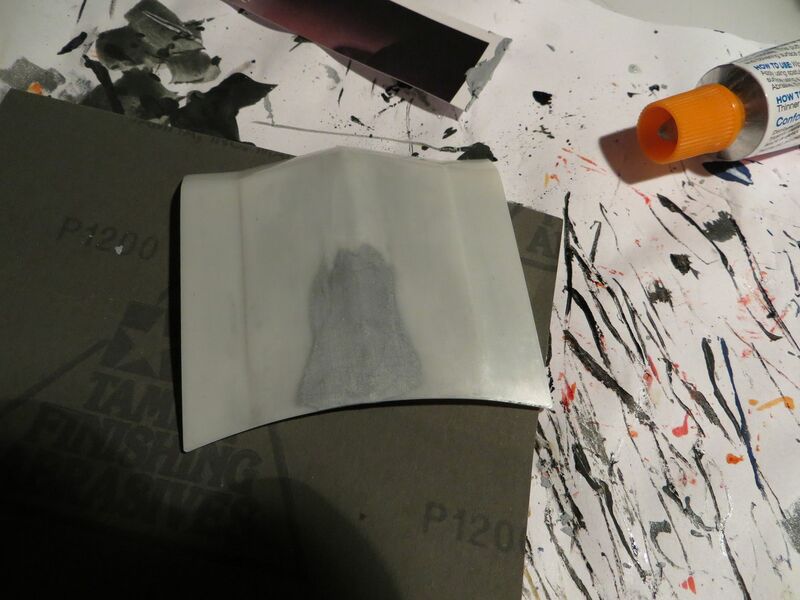 Then it would be trial and error to see what size to print and then bake the Shinky Dink down to. Okay now that's over - KUDOS!!! JOB WELL DONE! I can't even with how incredible your wok on this is! The customisation is just incredible! Thanks! 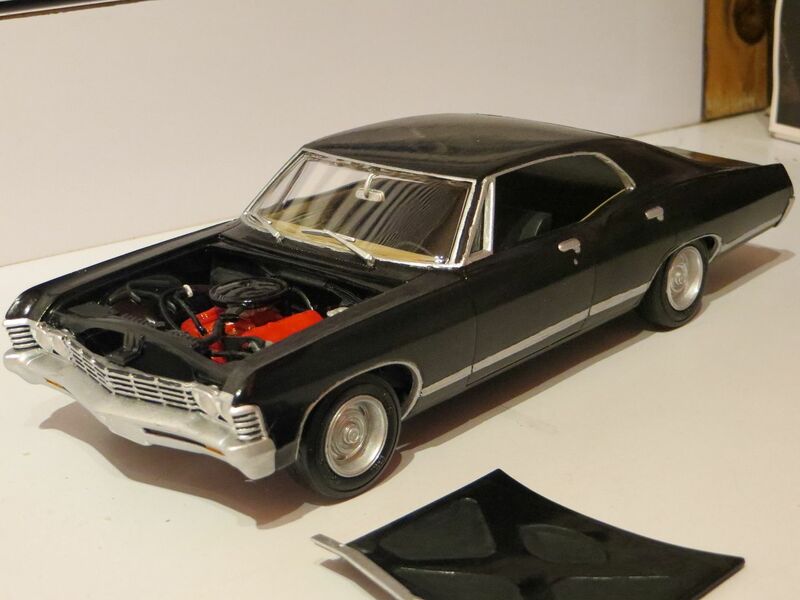 I've actually repainted one small thing since I took the pictures to correct a small mistake that only one person noticed and pointed out privately (at which point, I had also already noticed). So, it's now even MORE accurate.